HELP! MY DOG WAS CAUGHT AND TAKEN TO THE POUND! IS THIS RIGHT/LEGAL? My dog (or my neighbor's dog) was caught and was taken to the pound! Is this right? What do I do? 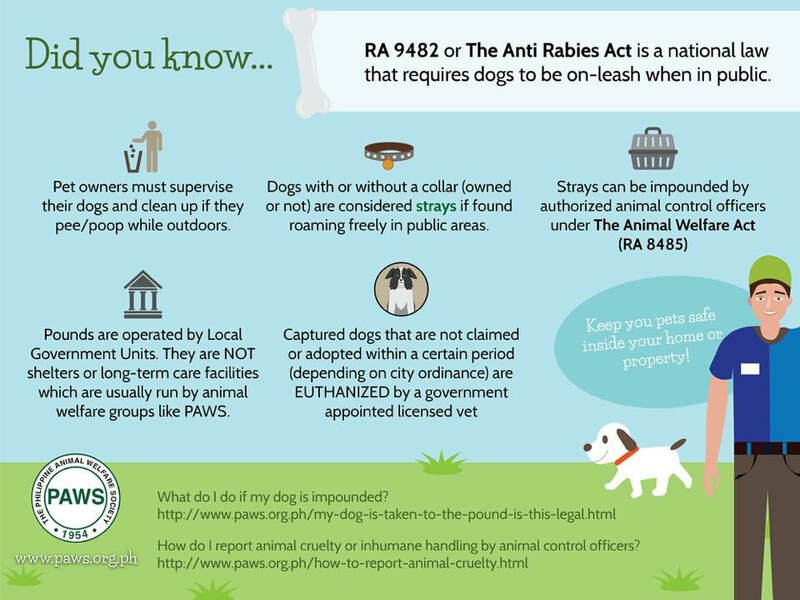 Under RA9482: The Anti Rabies Act, dog catchers and employees of the city pound are authorized to catch strays and/or loose dogs running around in public using humane methods. Owned dogs out in public that are not under the control and supervision of their owner (i.e., owned dog allowed to roam the streets without a leash and without his owner, owned dog is just outside owner's gate but with no leash, accidentally ran out) are immediately considered strays and are to be captured for the public's safety. 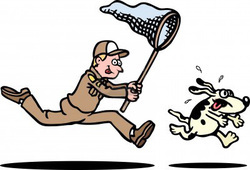 Animal control officers and dog catchers do not need to ask permission from the owner to catch and impound these dogs. Dogs that have been captured by Animal Control officers are placed in the pound where they are kept for a fixed holding period. Upon the expiry of this holding period, if no one claims ownership of the captured dogs, or no one adopts them, they are euthanized (legal under approved methods of euthanasia stated in Administrative Order 13 Revised Rules on Euthanasia for Animals). The most humane way to euthanize an animal is through barbiturates. Reality in the Pound. Space is most often limited with as many as 10 dogs being forced into a cage built only for two. They will also hardly ever be given food or water. Fights will often break out because of these stressful conditions and many dogs succumb to injury as they will also hardly have access to medical attention. Pound officials simply won't bother as the dogs will be put down after the holding period is up anyway. Owners whose pets were caught roaming the streets or public places should claim their pets immediately. 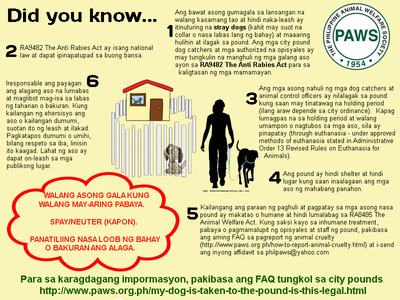 The holding period of dogs in the pound vary depending on the city ordinance (from 24 hours to 3 days to 1 week). Yes, there will be a fee to pay to claim your dog, but paying that fee is better than paying with your dog's life. Please also keep your pets indoors and/or make sure your home/yard/lot is properly fenced to prevent your pets from running out of your home and being injured by vehicles or picked up by city dog catchers and animal control officers or worse, dog meat traders. 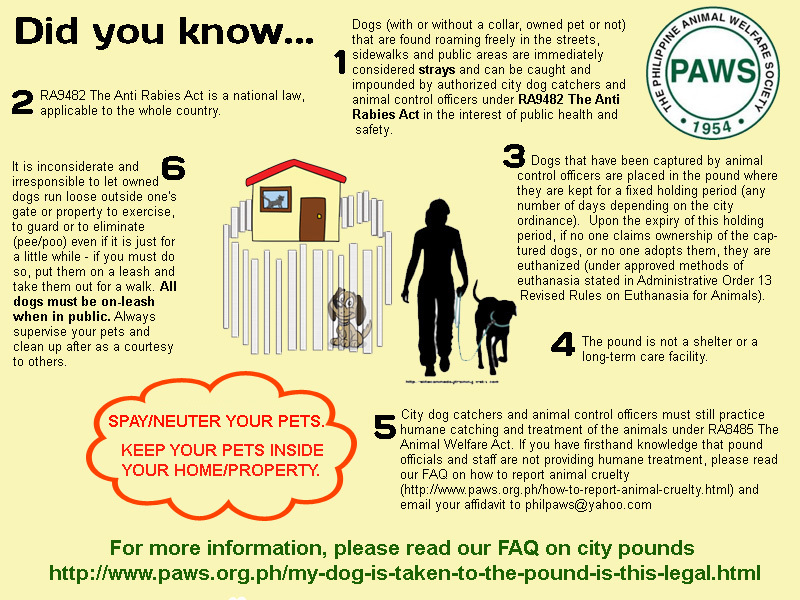 It is inconsiderate to other people and irresponsible to let them run loose outside your gate or property to exercise, "pasyal", or to eliminate (pee/poo) even if it is just for a little while - if you must do so, put them on a leash and take them out for a walk, and don't forget to clean up your pet's mess. CITY POUND NOT PRACTICING HUMANE METHODS FOR EUTHANASIA: If you have firsthand knowledge that the city pound is not practicing humane methods for euthanizing the unclaimed dogs, please provide the name, address and contact number of person-in-charge of said pound and your witness affidavit (details as to how you know the pound is practicing such illegal methods for euthanasia such as Tambucho Gassing or Electrocution) - send info TO: philpaws@paws.org.ph Please also provide your name and contact number in your email. Click here to see a sample witness affidavit, this can be written in English or Filipino. CITY POUND STAFF ARE CRUEL TO THE DOGS / CITY POUND NEGLECTING TO PROVIDE FOOD, WATER AND SHELTER: If you have firsthand knowledge that the dog catchers or persons in the city pound are violating RA8485 The Animal Welfare Act (i.e., neglecting, abusing or killing the dogs they have caught in a manner using illegal methods), please refer to HOW TO REPORT ANIMAL CRUELTY and submit the necessary info of the city pound dog catcher or city pound official (name, address), address of city pound and your witness affidavit stating the details/personal knowledge of the cruel acts - send info TO: philpaws@paws.org.ph A sample affidavit is provided in the link. Please also provide your name and contact number in your email. Despite knowing that the dogs in the city pound who are not adopted or claimed by their owners shall be condemned to death (by means of euthanasia / humane procedures as determined by the law) once the holding period has lapsed, the city pound must still provide proper food, water and shelter, and should practice humane treatment to the animals - in accordance with RA8485 The Animal Welfare Act Section 6 where it states it is unlawful for any person to maltreat any animal and to deprive or neglect to provide adequate care, sustenance, shelter. Please keep your pets on leash when in public places, regardless of size or of training. Please keep your pets indoors or make sure your home/yard/lot is properly fenced to prevent your pets from running out of your home and being injured by vehicles or picked up by dog catchers or dog meat traders. Please CLAIM your pet immediately if it is impounded. It is your responsibility to keep them safe from harm and to keep them from harming others. WALANG ASONG GALA KUNG WALANG MAY-ARI NA PABAYA. There would be no dogs (stray or owned) who would be caught, impounded, euthanized, harmed or killed if there were no irresponsible owners who allow their pets to roam freely outside the home and who spay/neuter their pets. Why are there strays on the streets? How to get strays off the streets? Walang asong gala kung walang taong pabaya. Safe dogs are dogs that are kept inside their owner's yard or home. Whenever you are out with your dog in a public area, keep your dog on a leash and be mindful of your dog. Your dog depends on you to keep him safe. Please do not fail him. If your city pound is not listed here, contact your CITY HALL or Local Government Office and inquire. The City Pound is under the City Veterinarian's office and/or the City Health office. Contact the City Vet Office to confirm their policies, holding period and claiming procedure. 2. If the pet is impounded, proceed to the pound keeper. If the dog is vaccinated, show the vaccination certificate to the pound keeper or registration receipt from the Barangay. If no certificate/receipt can be shown, pound keeper checks the master list. 3. Order of payment given to the owner indicating the amount to be paid. 5. Show official receipt to pound keeper, the OR no. is recorded. 6. Dog is released to the owner. Pasig City Fire Station at C. Raymundo Ave.
1. Go to the City Vet's office at the DSWD compound near the Pasig Public Market. Look for Dr. Glenn Manlapid, City Vet. 2. The claimant will be interviewed by the City Vet, and will be given a slip of paper which is to be presented to the Pasig City Municipal Cashier. The claimant will need to present the slip of paper to pay for the release fee in the amount of 150 pesos. 3. The claimant can return to the City Vet office, confirm payment of the release fee, and can then proceed to the City Pound to claim the dog. 1. Secure permit from QC City Hall in QC Circle. 2. 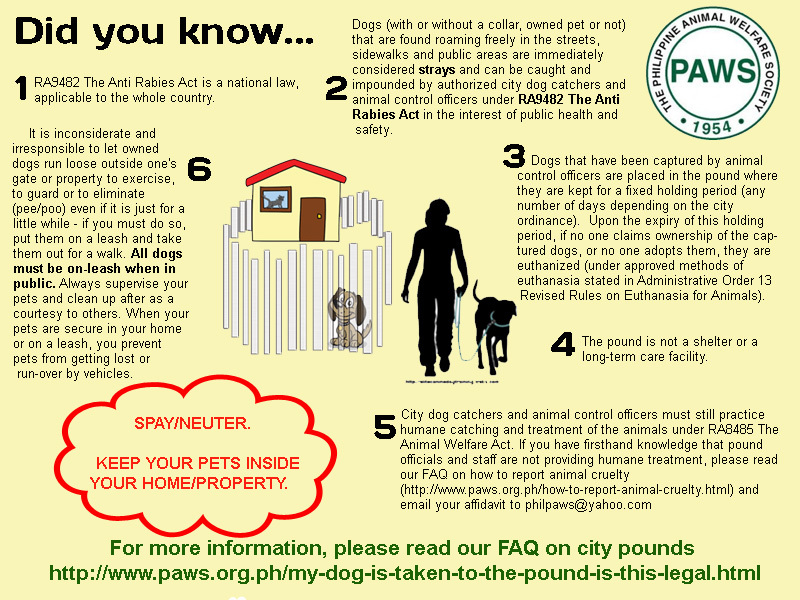 With the permit, proceed to Payatas dumpsite to confirm if pet is at the pound. 3. 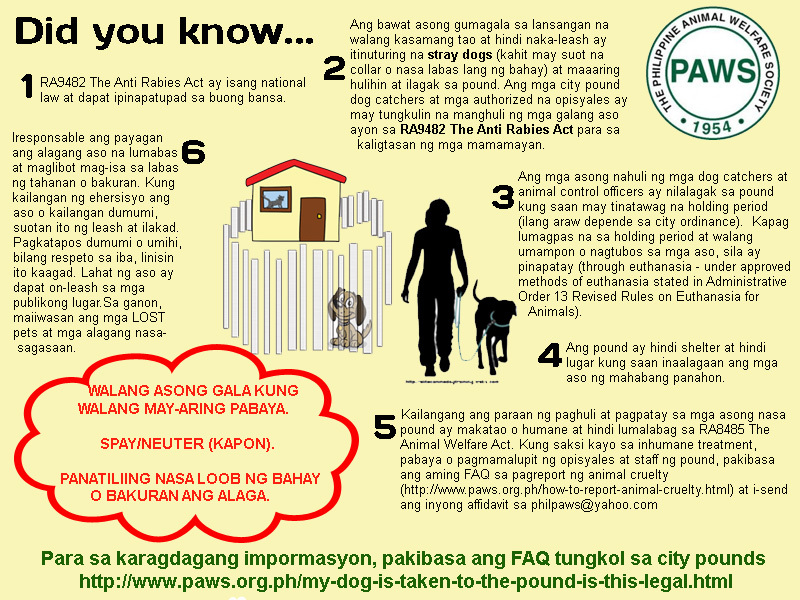 Once pet has been identified at the pound, proceed back to QC City Hall to pay the fine to claim. 4. Proceed back to the pound to claim your pet.